Don't worry, the title is configurable. And that stupid "News" tooltip too. This is O N L Y the source. You have to compile it on your own because you have to set two variables in che WNLClient. And NO, I'll not convert it into VB. I wrote a small launcher for World of Warcraft clients that looks a little bit like the Blizzard launcher. It adjusts the realmlist.wtf automatically, so the user must never follow guides like "Open you realmlist.wtf with a texteditor" (lots of users do not know what the hack a texteditor is), they just have to start the launcher and press Play. The top area of the launcher is a website. You can set the URL and do what ever you want. Scrollbars can be enabled. In the bottom of the launcher are three buttons: Options, where you can config the launcher, Support, where the user is redirected to your server support page (if you have one) and Play, to start the game. Above the buttons Options and Support is space for a small (max. 3 lines) text, like that one in blizzards launcher that appears if new patches are available. To use it just create a text file somewhere on your server and enter the URL in the options of the launcher, the text will be fetched from that URL. It looks a little bit boring but if you make your own launcher site with images and stuff it will look awesome! The whole program is written in C# .NET, so the user must have installed the .NET Framework. Download the binary unzip it somewhere and start it. The program will show you an error that the launcher could not be initialized. Just click ignore. The program will start now and you'll see "No URL has been configured.". Click Options and fill out the values. URL is the URL to the launcher site. RealmInfo is the URL to the textfile on your server where the text for the three small lines above the Option and Support button is in. Press Save and restart the launcher. If it doesn't works edit your configuration. If you get an exception that something is wrong with the URI's then make sure every uri (URL, RealmInfo and Support) have a leading http:// (hint: type the uri in your browser, open the site and copy-paste the uri to the config). If you leave the field RealmInfo empty then you have to open the cfg with a texteditor and remove the line "RealmInfo="! The users of your server must download the PLauncher.exe AND the launcher.cfg created by the launcher (in the same folder as the PLauncher), so you have to zip these two files and upload them and do whatever it needs. Post on your website the users installation guide. Download the launcher and unzip it to your World of Warcraft folder (e.g. C:\Program Files\World of Warcraft). 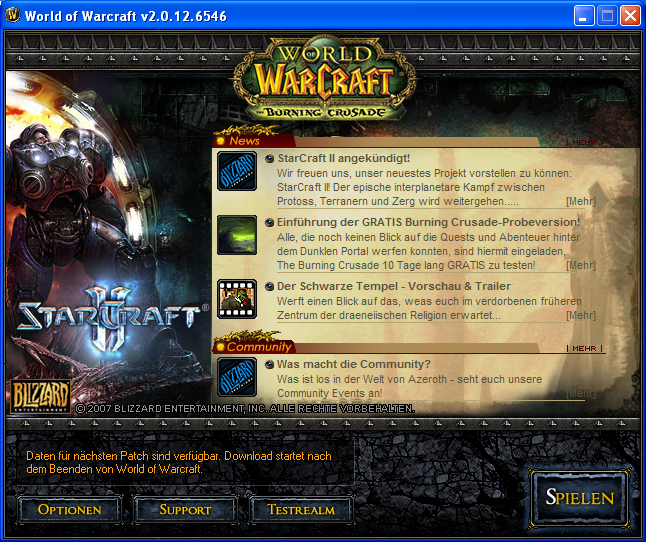 The PLauncher.exe and the launcher.cfg must be in the same folder as the WoW.exe. Make a shortcut to the PLauncher.exe somewhere (e.g. on your Desktop). Start the PLauncher and press Play. Enjoy. If you modify the program please keep the credits! If you have questions, problems or feedback just post it here! I haven't been playing WoW (retrail or arc) for over a year. So I don't know all the new designs and database structures and tweaks and values and all that, so don't bother me with "OMG I goz err0R on uR sc1ipAZZ!!! liek TABLE arc_user NOT FOUND. OMZG Wat to do??? halp plz!!" because I will not reply to this. Ich spreche Deutsch als Muttersprache. I speak German as first language. Je parle l'allemand comme langue maternelle. Ich spreche ein wenig englisch. I speak a little bit English. Je parle un peu d'anglais. Ich spreche ein wenig franz�sisch. I speak a little bit Frensh. Je parle un peu fran�ais. Hmm I have a question. Is it possible we can put a custom patch in a specific URL directory and every time we add something to that directory and the players start there launcher they will download a custom patch? well thats nice but is it possible to but that change sets directly into the sourcecode so the optinon buttom is not neccesary? do you have a news background for the url? Man, I love this Thanks Gachl! Nice work I will try this tomorrow. Looks nice, Just one question/problem. After making the config file, and restarting it, I'm getting an Unhandled exception error message, saying "invalid URI: the format of the uri could not be determined" I do have .net installed, as I just had to update to .net 3.5 sp1 for another program. Any ideas? Could it be because I had to install the 3.5 sp1? I've even tried compiling straight from the source and still get that error. Also be sure (i'll add that to the administrator manual) that if your serverinfo url is empty (because you dont use it) open the cfg in a texteditor and remove the line "RealmInfo="
RealmInfo should not be used...? Gachl, You are my hero. Is there a way we can view the design layout in visual basic? cause i wanna add a few buttons.. i don't see anywhere to design it further..
Umm.. no I don't have that stuff as VB but I think (but I am really not sure) there are some converters out there in teh internetz (ask google) - or else give me a list of things you'd like to have, I'll try to add them and give you source + binary. ok, I'll try to convert that to vb by myself but I am not very good in vb so it will take a little bit. I'll post it here if it's done.